I love a good salad, especially if I can get creative with it and add interesting ingredients. 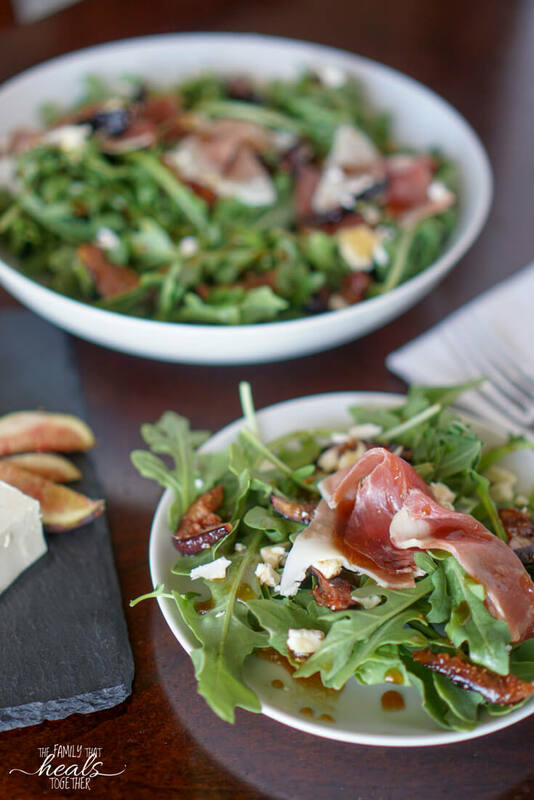 This Roasted Fig Salad with Prosciutto and Feta hits all the right notes. On a recent trip to New York City, I was determined to find the best gluten-free food the city had to offer. I’m not sure I accomplished that, as it was just a quick couple of days, but I did find some delicious eats! I decided I would remake it as soon as we got back home and made it to the store for ingredients. Of course, I tweaked the original fig salad and added my own flare, because I’ve never been one to stick too closely to a particular plan… salads… life… in general. This salad has such a nice combination of flavors: a little sweet, a little bitter, a little tart, and a little salty. I’m a big fan of mixing lots of flavors together to keep things interesting. 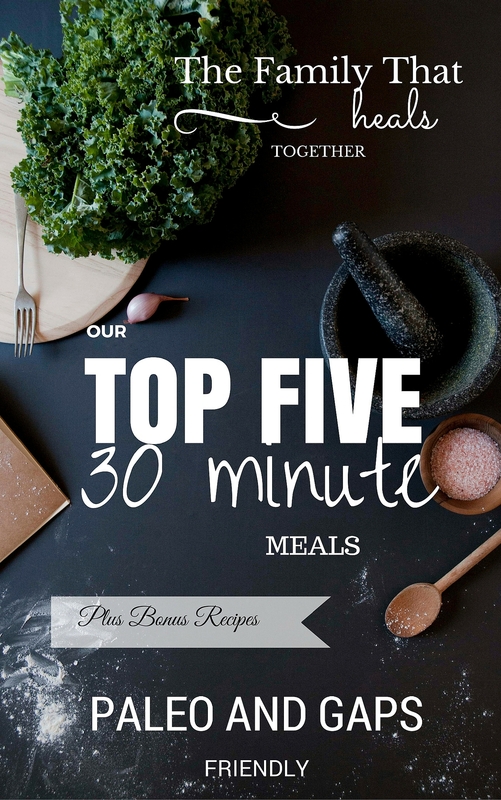 Are you one to mix foods and flavors or do you like to keep your foods all separated on your plate? When I was a kid, I mixed my canned corn with my potatoes. The combo of buttery, salty, and sweet was delicious. Honest. 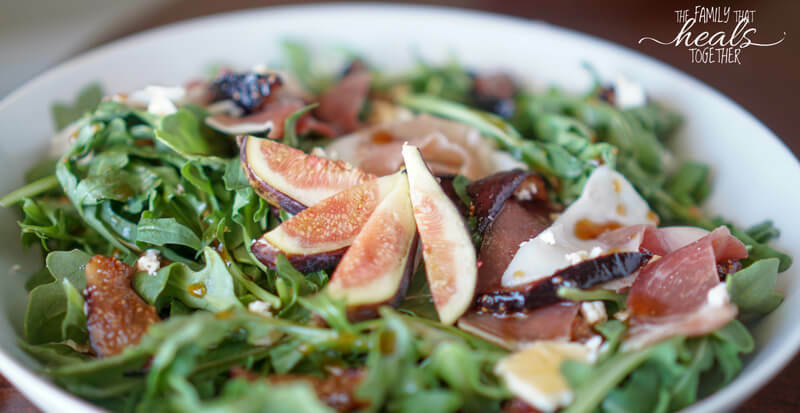 So anyways, this Roasted Fig Salad recipe perfectly combines a variety of flavors, especially for someone like me who enjoys putting together unusual ingredients. 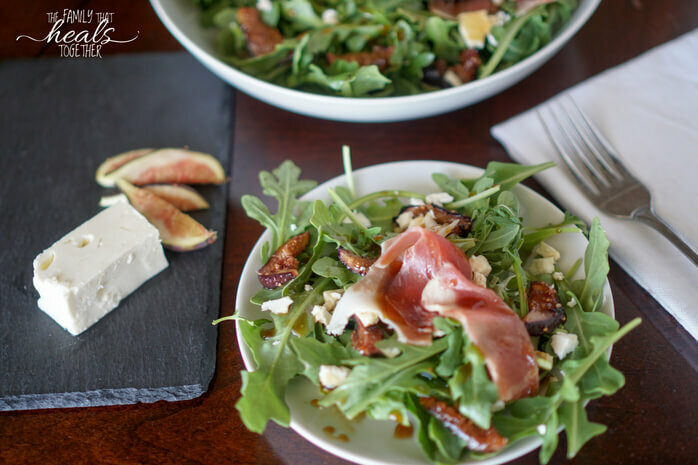 I hope you love this Roasted Fig Salad with Prosciutto and Feta as much as I do! Slice figs to about 1/4" thickness. In a small bowl, combine balsamic vinegar, honey, and olive oil and stir well. Place sliced figs in a single later on a baking sheet, then drizzle half the balsamic mixture over the figs, reserving the other half for later. Roast the figs for 10-15 minutes, stirring halfway. The figs should be lightly browned and sweetly fragrant. Remove and allow to cool while you assemble the salad. Fill a large salad bowl with the arugula, then crumble the feta and spread it over the arugula. Add the prosciutto and stir to combine. Gently top the salad with the roasted figs, then drizzle the remaining balsamic mixture over the salad. Refrigerate, if desired, before serving.